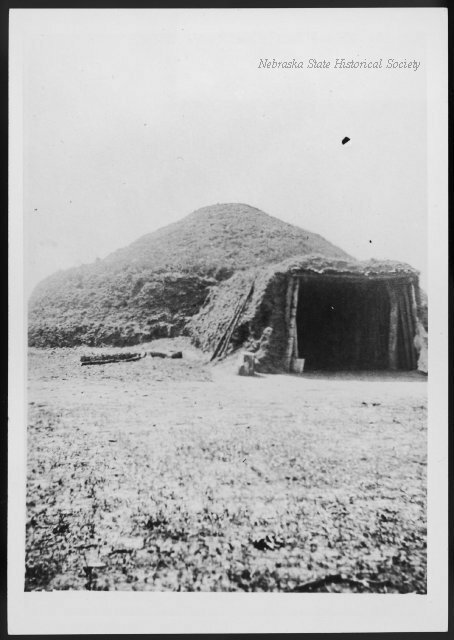 Before the Pawnee Indians were placed on a reservation, they located their last earthlodge villages on these nearby bluffs. Pa-huk' hill, one of the five scared places of the Pawnee, was also here. The villages were occupied from 1850 to 1859 by the Skidi, Tappage and Grand bands led by head chief Petalesharo. The Republican band lived some distance up stream. The Pawnee once numbered more than 10,000 people were recorded in history as early as 1541. Often harassed by the Sioux, the erected sod walls to protect their villages. The Pawnee were friendly toward whites, and some later served as army scouts. By 1833 the tribe had given up all of its land north of the Platter River. General John M. Thayer and O. D. Richardson, representing Territorial Governor Izard, held a conference with the tribe here in 1855. In 1857 the Indians signed the Treaty of Table Creek, ceding the rest of their land to the whites. In return they received a reservation along the Loup River near present-day Genoa. In 1875 the Pawnee moved south to Indian Territory, ending their settlement in Nebraska. “Pawnee Villages,” Explore Nebraska History, accessed April 19, 2019, https://mynehistory.com/items/show/159.